New Years Eve Buffet tickets now on sale! 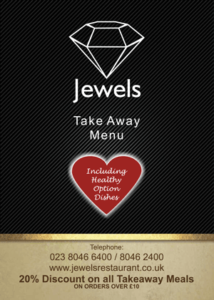 A warm welcome always awaits you at Jewels Restaurant Southampton, a smart Indian restaurant in the modern style located in West End, Southampton where you can enjoy the finest Indian dishes freshly prepared by our expert chefs using carefully chosen fresh ingredients. We've long been renowned for the quality of our food and our hospitality since we first opened in 1997, but now with twice the floor area and smart new decor, there's more room to enjoy the best of Indian cuisine with your family and friends. Our eat-in or takeaway menus cover the whole range of curries and other Indian dishes from mild through to hot. We offer some more unusual regional specialities, with particular emphasis on tandoori dishes, always freshly cooked with the finest spices and other ingredients. Menu options include healthy options for slimming plans and low fat diets. 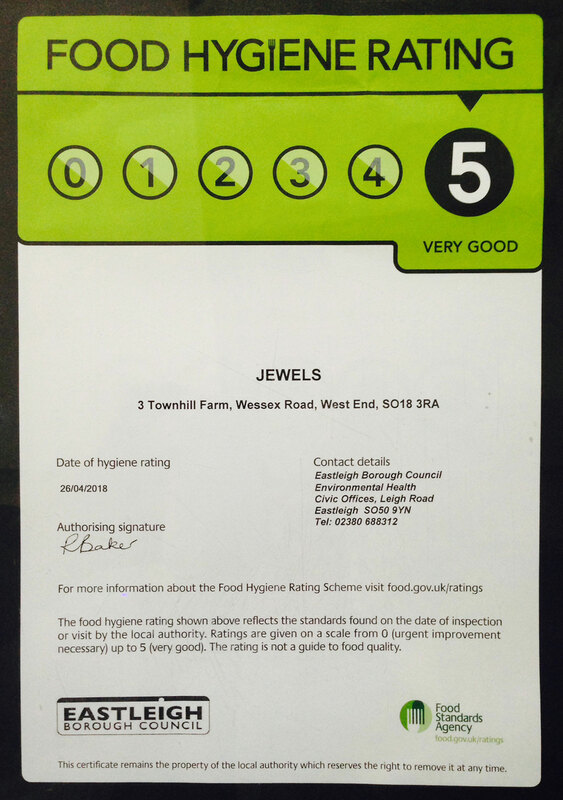 Jewels restaurant is fully licenced and our well stocked bar offers over 30 wines, as well as beers and spirits. One of the top Restaurants in Southampton! With plenty of space and smart stylish accommodation, Jewels Restaurant is also a great venue for parties, weddings and other special events. Call us to discuss what we can do to make your special event into one that's extra special! Takeaways are a popular option. All dishes are available to take away with a special offer of 20% discount off the menu price six days a week. We offer a comfortable lounge area while you are waiting for your takeaway to be prepared. We're open from 5.00pm to 11.30pm Tuesday to Saturday and 3pm to 10.30pm on Sundays. Visit us soon for the best in Indian cuisine!